The Graduate Supply Chain Management Association team from the Broad College of Business advanced to the final round of the Global Supply Chain Management Initiative’s Intercollege Graduate Case Competition held at Purdue University on Feb. 14-15. 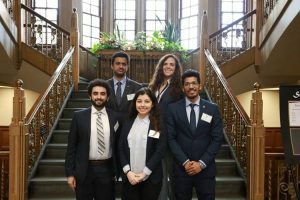 The Broad team, consisting of Maria Haugen, Vivek Wali, Rahul Ramesh, Zarina Tokhtaeva, and Suraj Sanal, placed second overall, and first among Big Ten schools in the competition including Illinois, Wisconsin, and Purdue. The University of Pittsburgh won the competition.